Deciduous (oak-hickory or beech-maple) or mixed forests, especially in ± disturbed sites, such as roadsides, trails, banks, and clearings; moist thickets and shores; fields; marshy and swampy ground, sometimes under cedar or tamarack. Our most common species in most areas of the State. 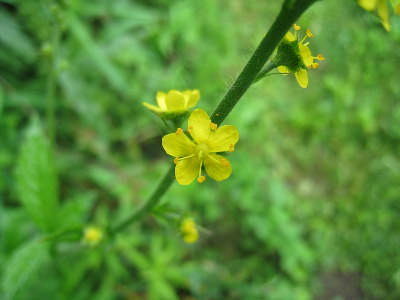 Easily recognized by the ± densely and conspicuously glandular axis of the inflorescence (with only very long spreading hairs in addition), pedicels, floral tubes, and lower leaf surfaces, together with the widely spreading or reflexed outer rows of hooked bristles on the floral tube. MICHIGAN FLORA ONLINE. A. A. Reznicek, E. G. Voss, & B. S. Walters. February 2011. University of Michigan. Web. 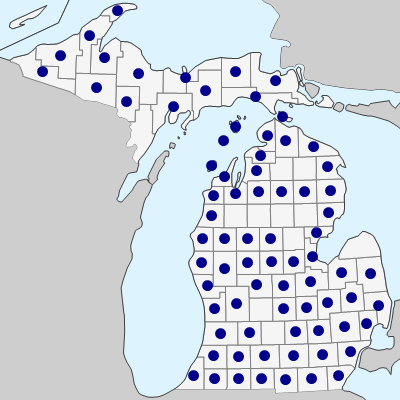 April 19, 2019. https://michiganflora.net/species.aspx?id=2416.